Daisies are one of my favourite flowers. They always make the grass look more cheerful and yellow with white is a favourite colour combination of mine. A few years back they became suddenly the height of fashion thanks to Marc Jacobs for Louis Vuitton. 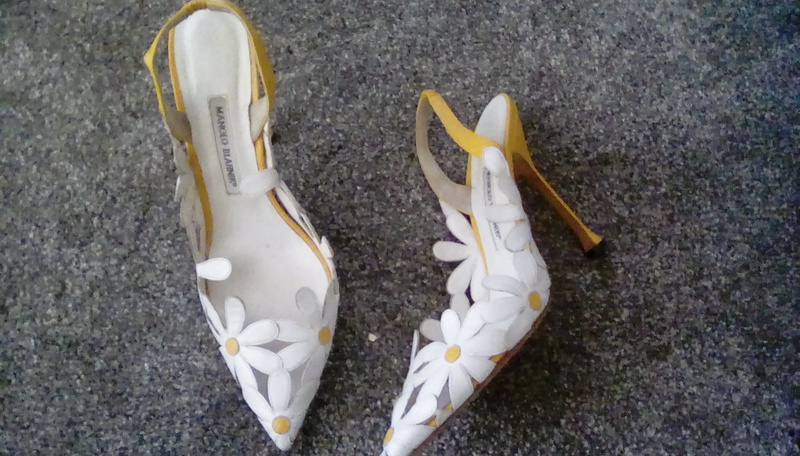 And then !y beloved Manolo Blahnik produced some daisy covered slingbacks with a yellow heel. It was lust at first sight! Today was the day I finally got to wear it! To go to the hairdressers and then to run some shopping errands for work… But with the weather in the UK so variable I have learnt to jump at the opportunity to wear my summer clothes. And I felt fabulous doing so!